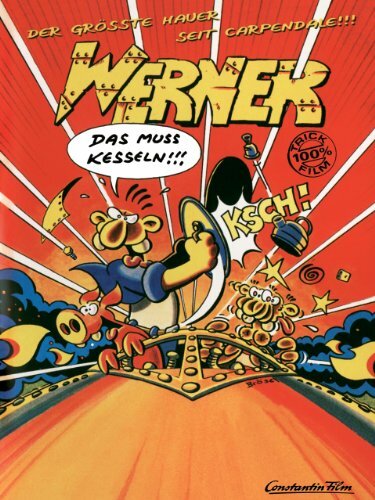 original title: Werner - Das muss kesseln!!! Because of a bet, Werner and his friend have to construct the fastest vehicle to win a race, because life depends on it. Many, if not most fans, where disappointed by the first part, Werner – Beinhart", mainly due to the film combining animation with real-live acting, making it plausible. Not that the first "Werner" was a flop at the box-office, selling a respectable five million tickets, but critics and fans generally gave the film a negative review. The popularity of the comic declined sharply after 1990, mainly due to the fact that they now came in colour and that the stories still reflected the life of "Werner" creator Brösel, who, by now, had become rich and (some say) decadent. The fans wanted a "Werner" who's riding his semi-homemade bike while sipping on a bottle of beer, not a rich "Werner", who sips champagne and takes his friends on fancy rides in his Cadillac. It took six years before the "Werner"-team would muster the courage for a sequel, this time keeping it completely animated, yet the fans eyed the film with suspicion. The story is no longer a combination of early "Werner"-short stories but has one, straight storyline: Werner and his brother Andi (voiced by Brösels real brother) are building an ice-sled, combining an airplane engine and home-brewed fuel. They enter a bet with the snobby Restaurant-owner Nobelschröder: should Werners ice-sled loose against Nobelschröders Bentley, Nobelschröder will cook Werners pet-pig Borsti in his Restaurant. Werner looses the bet, Borsti is cooked, but, having fixed the sled, Werner and Andi race back in time, rescuing their pet-friend. They race Nobelschröder for a second time, winning the bet in the end. Super-sleds and time-travel is not what the "Werner"-fan expected nor wanted any part of. Nor did they want any visual gags that you would usually find in some Warner-cartoon for kids. They wanted rebellious rockers, drinking, cussing and making fun of their "straight" environment. There was very little of either. The most positive thing about "Werner – Das muss kesseln" is the soundtrack, having a similar mix of Hard Rock- and Country music and featuring a number of catchy songs. But that alone doesn't make a good movie. 4 from 10 points. This is the second part of the trilogy (so far ...) of movies based on the "Werner" comic books, which have long achieved cult status in the German - speaking part of the world. The dry and minimalistic humour of the original books could not be expected to translate well to celluloid, but in addition to this the plot is paper - thin and unoriginal, and the animations often look amateurish. 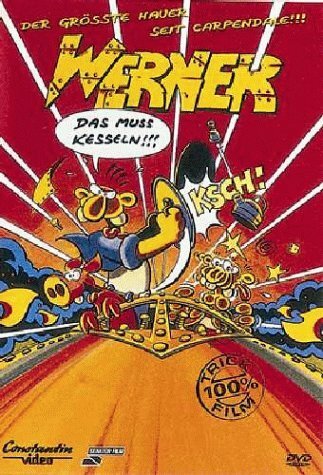 Save your money for video rental or cinema ticket and invest it in one of the earlier "Werner" comic books (those that were originally published by Semmel Verlach). And a few bottles of the ember nectar.